YEAR-ROUND FUN FOR YOUR SIMS! Add weather to your Sims' lives to tell new stories, enjoy seasonal activities, and celebrate heartfelt holidays with The Sims 4 Seasons. Make the most out of the weather all year round, from crisp snowfalls to sweltering heat - every world is affected by seasons in unique ways. Create a winter story with ice skating, befriend a magical scarecrow at the fall harvest, share a spring fling during a downpour, or host a summer pool party. Gather friends and family to celebrate holidays complete with traditions, gifts, and special guests. Stay warm or keep cool with all-new outfits to brave the elements. Even begin a blossoming gardening career as a botanist or by crafting floral arrangements! 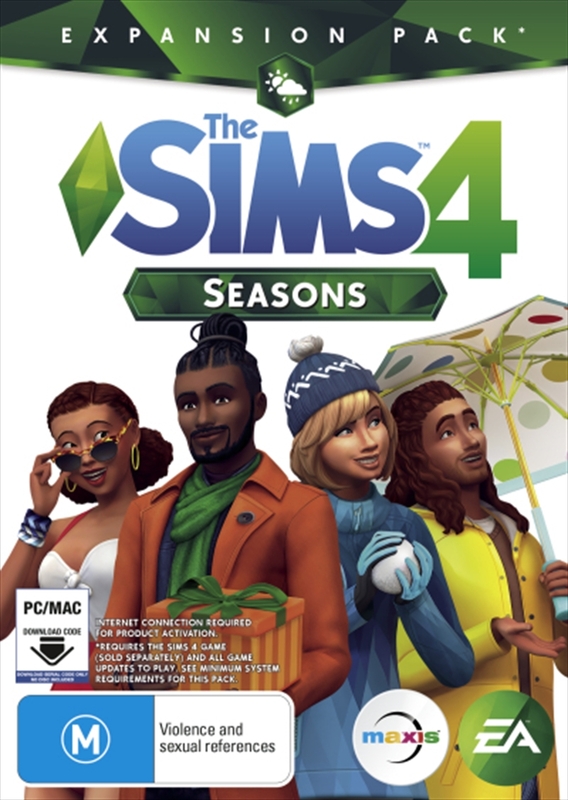 Experience Impactful Weather - Enjoy four stunning seasons and dynamically changing weather that affect all aspects of your Sims' lives. From hot and sunny to blustery and snowy, every world's climate is unique and impacts your Sims' choices, relationships, and daily activities. Control the elements to summon thunderstorms, clear up overcast skies, or jump between seasons.